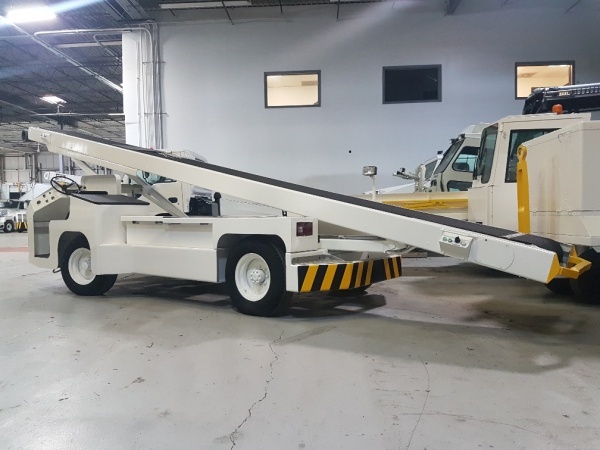 Used Charlatte CBL-2000D belt loader with cab is capable of servicing all types of aircraft with door sill heights ranging from 40" up to 172-inches. Freshly painted. 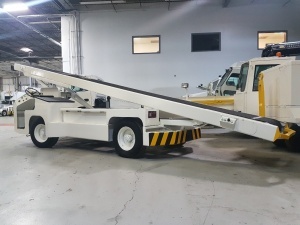 Used 1998 Charlatte CBL- 2000E is an 80-volt electric belt loader with a 25-foot belt length and is capable of widebody service with its reach of 30- 172-inches. The CBL- 2000E has a new battery and charger (battery has a 5-year warranty). Freshly painted. Used 2007 Charlatte CLT-200E electric lav truck is newly painted and in good condition. The low-profile design is perfect for regional jet and narrow-body applications. The unit incorporates a 200-gallon waste tank situated at the front of the vehicle to simplify movement around the aircraft. The 100-gallon water (blue juice) tank is located in the rear behind the 80V/ 500 Ah battery industrial battery. Power is supplied by a 40 hp (30 kw) AC motor which is directly coupled to the heavy-duty Charlatte rear axle. The unit has excellent visibility, maneuverability, and has a maximum speed of 19 mph (30.5 km/h).